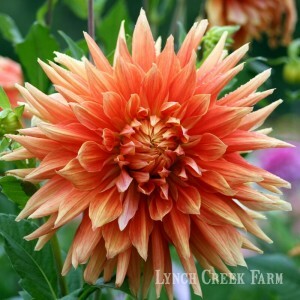 Dahlias are a guy's kind of flower, according to the gang at Lynch Creek Farm. That leads us directly to the first in a set of weekly polls on the Farm's Facebook page, which asks this question: Which dinnerplate dahlia do you think our owner, Andy Hunter, called "the most masculine dahlia of all?" Editorial comment: of COURSE if we're talking most masculine dahlia, it would HAVE to be a dinnerplate dahlia, wouldn't it? Seriously, though. Dahlias do have masculine appeal. Think about it: the guru of all dahlia-growers, Bill McClaren, who wrote the Encyclopedia of Dahlias, is a guy. The entire executive board of the American Dahlia Society consists of guys. Candidates in the current poll are Spartacus, Bodacious and Alfred C. No, we don't know the answer, nor do we know why dahlias with names like Drummer Boy and Wildman didn't make the cut for the masculinity competition. But nobody asked us. 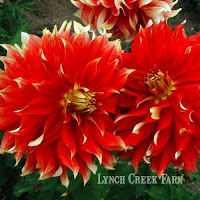 Check out Lynch Creek Dahlias on Facebook for the next poll (someone at the Farm is threatening to post one every Monday) and the results. Oh, yeah, and if you "like" the Farm on Facebook, you'll be in line for a drawing for free dahlia tubers! UPDATE: Andy's "most masculine dahlia you can grow" recommendation was Spartacus. But Facebook fans outvoted him: they chose Bodacious, four-to-one. Sorry, Andy! Flowers or tubers: Yes, you CAN eat your dahlias!